Since I homeschool. I am always on the look out for ways I can teach while the kids have fun. I have found nothing less than that with Magformer sets. 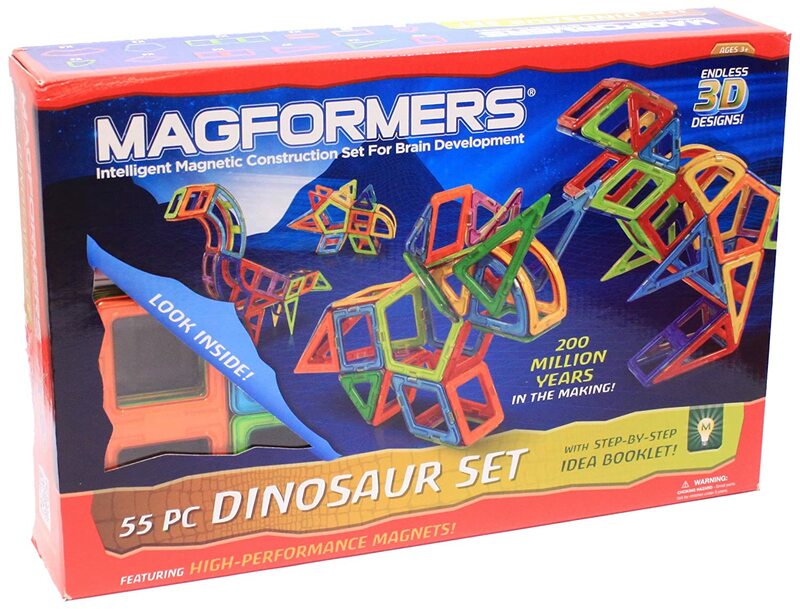 Magformers are high performance magnets that stick together on all sides so kids can either build one of the items in the instructions, or just play and have fun on their own. NEW! 46 High Performance Magnets in New Nautical Colors! Step by Step Idea Booklet Included! An educational experience that's FUN! Build a variety of deep sea creatures such as a dolphin, shark, or whale using our all new nautical colors. Create more than 10 different nautical builds using the step by step idea booklet included with your set! Create endless 3D designs using 46 High Performance Magnets. Conforms to CE, ASTM and EN71. Xander LOVES this set. First, he built everything in the instructions, and then went on to build some very wild "sea creatures" that I didn't even know existed! I like the Magformers Deep Sea Set because I am able to let him be creative, while he is able to follow step by step instructions without my help. The second set I received for review was the Dinosaur set. NEW! 55 pieces in awesome new colors! 200 Million years in the making! The 55 pc Dinosaur Set comes in Awesome New Colors and Includes a Step-by-Step Idea Booklet! Create your own Stegosaurus, T-Rex, Triceratops, Brontosaurus and more! Add Your Imagination and the 3D designs are endless! Riley REALLY enjoyed this set, and I liked that he could build everything without having a meltdown. Sometimes when he plays with block building sets, he gets frustrated, but this was really good for him because the pieces easily stick together. You can purchase the Dinosaur Set here and the Deep Sea Set here.